Aware that Rodney Parade proclaims itself to be one of the oldest grounds in the Football League, I made my way there pretty much as soon as I arrived in Newport, to allow myself plenty of time to poke around the archaeology. But what a crushing disappointment it proved; for I do not think I have ever come across a sporting venue with such an unprepossessing exterior. Approaching from across the Newport City footbridge, my first encounter was with the featureless grey expanse of the rear facade to the Hazell stand. Circumnavigating the ground, there was practically nothing to see; Rodney Parade almost totally hidden from view behind either housing or walls/fencing. One would almost think the town to be ashamed of the place. I encountered two locked gates, both of which, although rather ornate, appeared to belong to the local rugby club. Finally, there was an understated hole in a brick wall, which appeared to represent the main/only entrance to the ground. Along the footbridge - the Hazell Stand exterior can just be glimpsed at the end of the path. Main entrance to Rodney Parade on Grafton Road. Returning nearer kick-off I discovered this was indeed the entrance to Rodney Parade, although the actual football ground was situated across the Newport RFC pitch. 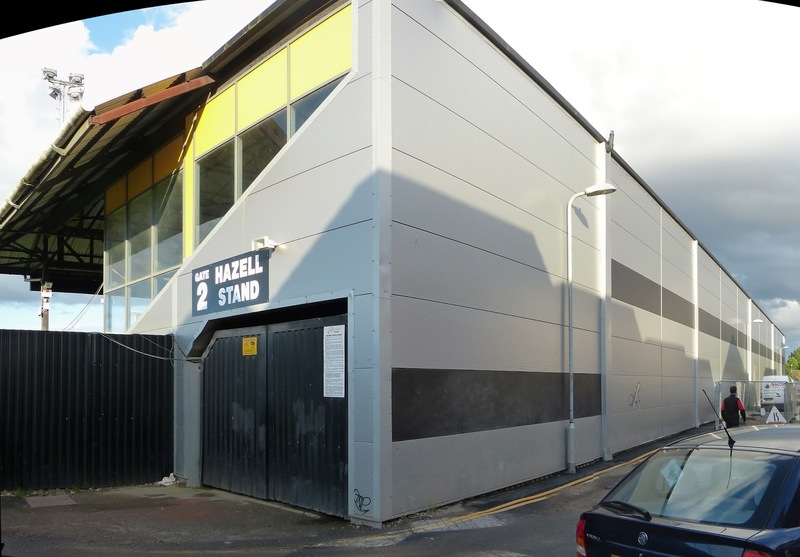 The oldest part of the ground appeared to be the aforementioned Hazell Stand, although only the paddock in front of the structure looked to be open to the public this evening. The southern end represented an odd jumble indeed; consisting of what looked to offices, a dinky little changing room pavilion plus a small area of uncovered seating into which overspill away supporters had been poured. The north end comprised shallow uncovered terracing; also unused. I sat in the newer Bisley Stand which, rather oddly, extended way past the goal line, to the extent one could almost view proceedings from behind the goal, if one so wished. The last time I had seen anything similar was at Carlisle – there a consequence of erecting a new stand with a view to shifting the pitch. Which never happened. Terry Butcher and Russell Osman (L) hope their side can break their winless run. Swindon's Anton Rodgers and Fabian Robert get the second half underway. Barrow thwacks another into the defensive wall during the second half. Newport keeper Rhys Taylor punches away Rogers' free-kick. Not sure who the Swindon man is taking the tumble here. As to this evening’s match, well it was a fairly uneventful affair I have to report. Swindon looked the more accomplished lot early on but, after scoring an early goal through Anton RODGERS (Brendan's son) after 19 minutes, appeared more than content to sit back on their lead. Newport, who to their credit persisted with attempting to build patiently from the back, never truly looked like getting back onto terms until, with 18 minutes remaining, Aaron COLLINS coolly equalised when put through by team-mate Seth Nana Twumasi. There was a consequent flurry of activity as both sides attempted to avoid the penalty shootout raffle – no extra time this evening – but in truth only home ‘keeper Rhys Taylor was called into serious action. 1-1 it finished with Swindon winning the subsequent shoot out 7-6, Newport goal scorer Collins being the chap unfortunate enough to miss the decisive spot kick. Thus leaving Terry Butcher’s side still awaiting their first victory of the season, seven matches in. I shall follow the progress (or otherwise) of 17-year old defender Regan Poole with interest.